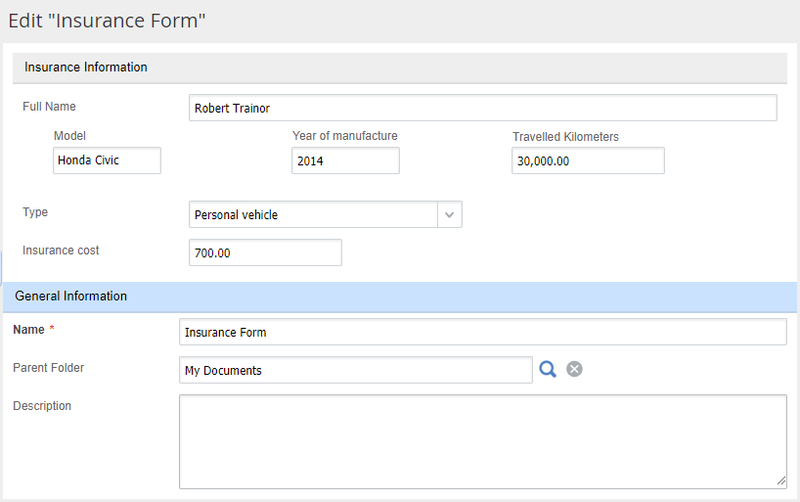 The form builder allows editing forms of documents and other objects. You can add panels, tabs, columns, and make fields required. You can also add you Razor markup. It may be useful if you want to create a unique, complex and convenient form. To edit a document form, open the Document Management tab in the Designer, select a document type and switch to the Forms (views) tab. Any document type has three forms: for editing, creating and viewing. When you click on the editing icon next to the required form, the form builder opens. 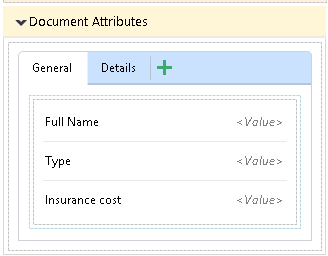 A panel with all the document properties that can be added to the form. 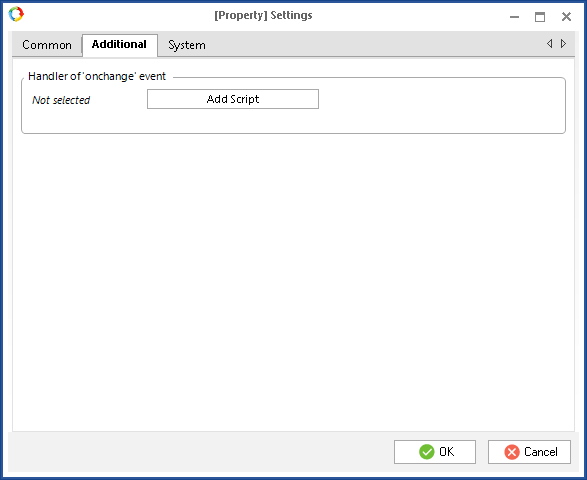 Properties can be added to the form with drag-and-drop. Toolbar. It contains various elements that you can add to the form. Column allows placing data in a column. You can place several columns on the form. String allows placing data as a string. Panel allows grouping various attributes on the form. A panel can be collapsed and expanded. Tab allows placing data in tabs. Text allows placing a text on the document form. The text will be uneditable in the web application. Let's edit the form using the form builder. Fig. 4 and 5 show two tabs of the document view form. The tabs are added using the Tab element. Let's take a closer look at the process of editing a form. Fig. 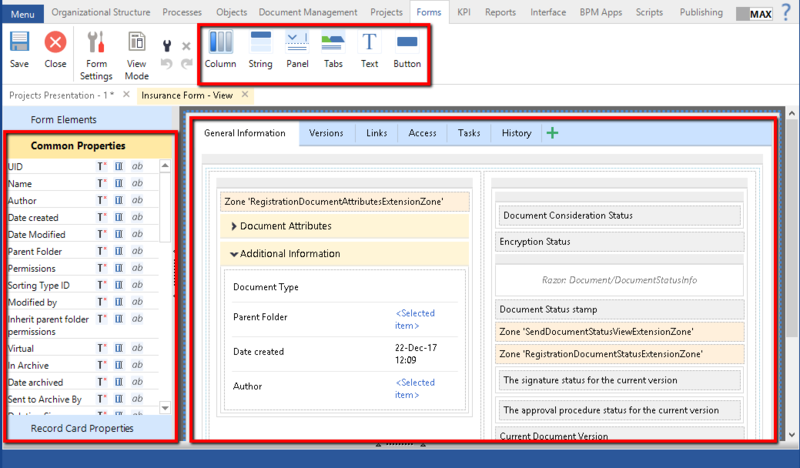 6 shows a panel, which by default displays all the document attributes, added by a user. If you need to change their order or display, remove this panel and create a new one. 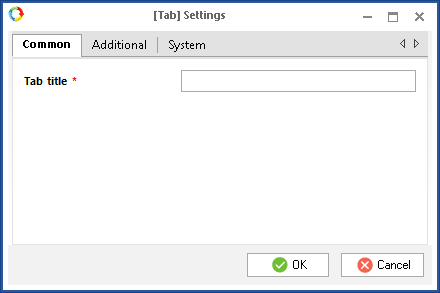 To create tabs, click on the green plus icon (fig. 7). In the opened dialog box, enter the tab name. Fig. 9 shows the created tabs. You can add attributes from the side panel to the tabs. 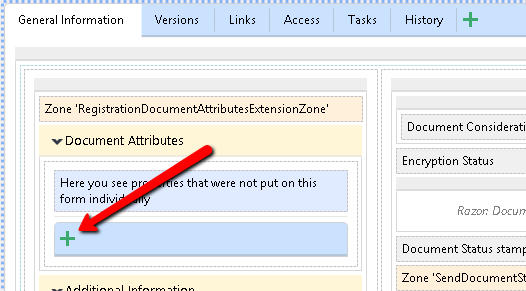 To delete a tab or any other element, use the context menu (fig. 10). Let's take a look at the Panel and Column elements taking the editing form as an example. Fig. 11 shows the settings of the Panel element. 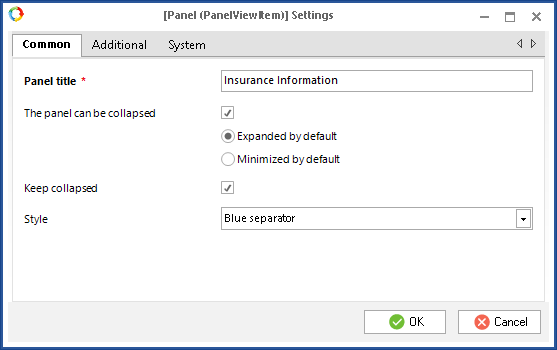 You can specify the panel header, make the panel collapsible and set its default state. The Keep collapsed setting defines whether the system will remember the state of the panel when the form was opened the last time. In the Style field, you can set the appearance of the element. Fig. 12 features an empty column. Fig. 13 shows a panel, which contains several elements, such as columns and attributes. The panel is collapsible. All the fields are divided into two columns. The highlighted text is created using the Text element. This tool adds an uneditable text to the form. It can take up one or several lines. You can make fields on the form required (fig. 14). Open the settings by right-clicking on the element and selecting Settings. Checking the Required box makes the field required on the form. The Read only setting forbids editing the field. In the Name on Form field, you can specify a name that will be displayed on the form. It may be different from the field name. In the Description field you can add a field description. On the Advanced tab (fig. 16), you can add a script that will be executed when changing the field value. These are the main tools of the form builder. In case they are insufficient, and you need to, for example, change the width of a field, you can use Razor markup. Open the settings of an element on the form and specify the path to a markup file. Fig. 17 shows an example of the Panel element settings. In the Razor Form field (fig. 17) specify the path to a markup file. It must be located in the …/UserConfig/WebApplication/Modules/…. folder. The "\" characters in the path (used in Windows) must be replaced with "/". Relative path means that everything before /Modules is replaced with "~". I.e. a path starts with ~/Modules/. The path to a file with user markup depends on the location of the main (system) markup file, that you are going to edit. The markup you are going to use to change the form augments or partially replaces the system markup, that is why it is located in a similar path. Since you need a path to a system file, find it in the folder Web/Modules. Then copy the path and create a similar folder structure in the folder WebApplication/Modules/…, located in the configuration folder. A path to a user markup file can have the following structures, on which the relative path depends. It is specified in the Designer, that the system connected the markup file. 1) If the path to the file does not contain the Shared folder, then full version is specified ~/Modules/(all the other nested folders)/FileNameDifferentFromTheDefaultName.cshtml. 2) If the original file is located in the Shared folder, then you don't have to start the path with ~/Modules/, you can use a relative path to the …/Shared/… folder and specify the file extension at the end. ~/(all the folders inside Shared)/FileNameDifferentFromTheDefaultName. The markup file name must be different from the system file name. 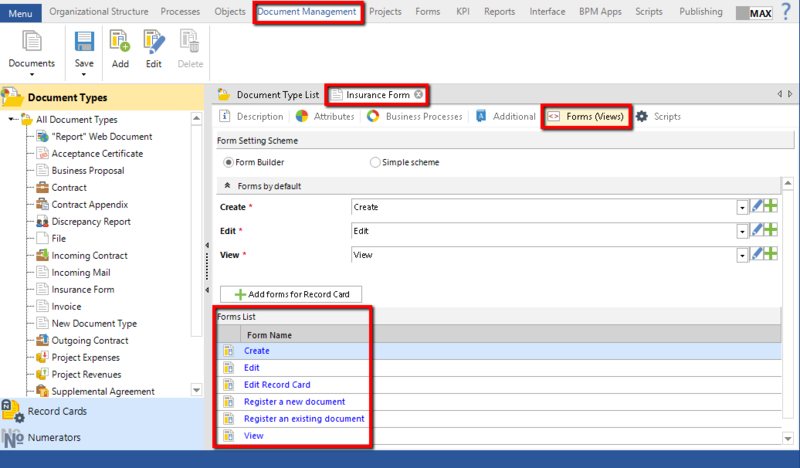 If you need to change several document forms or several elements on one form, then you need to create several files with different names, but you can place them in one folder. If names match, the system will use one of them, according to its internal parameters. 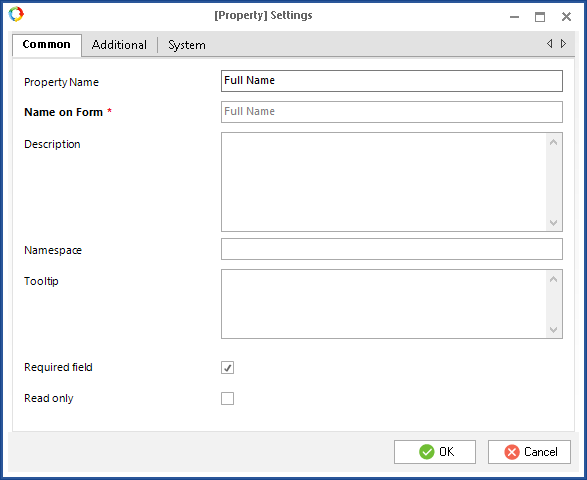 This way you can change not only document forms, but all the system objects, for which the form builder is available, such as contractor page and task form. or use a relative path ~/ Document/EditDocumentFormPanel.cshtml. 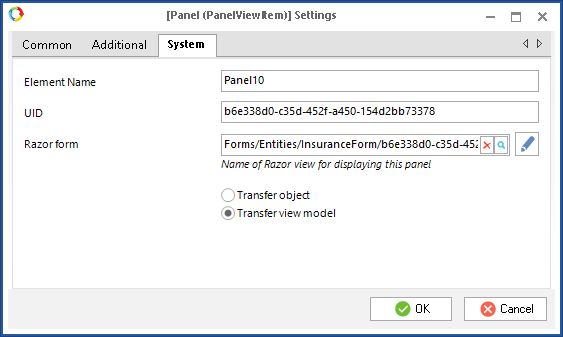 If you place the file EditDocumentFormPanel.cshtml in the folder \UserConfig\WebApplication\Views\, then you can specify ~/Views/EditDocumentFormPanel.cshtml. In the fig. 19 you can see an example of a form changed with a user markup. Below is the markup used in fig. 19.
all the fields are placed in rows and columns of a table (tags <tr> <td> </td> </tr>). <tr>// Second row with several fields.